Last night we had our annual auction at our quilt guild meeting. Throughout the year member’s earn “quilt bucks” by getting involved in our guild’s activities. Basically it is monopoly money, but it has been a successful motivator for many of our members. For example, one might earn 5 bucks for making a block for our charity committee, or 10 bucks for sewing the binding onto a charity quilt. We have a few guidelines for amounts to be awarded, but each chairperson has some leeway as well. Bucks are then saved by the members throughout the year to be used to buy items at our annual January auction. Items for the auction are donated by members. It’s a good chance to clean out our sewing rooms of excess fabric, kits, patterns, UFO’s etc. This auction is certainly an example of the cliche that “one man’s trash is another man’s treasure”. Bidding was very spirited on some items, reaching $300 on one. (Keep in mind–monopoly money!). This year we had a new wrinkle (pun intended) added. The board members added some mystery items. Wrapped securely in brown paper, only one member knew what was in each of the mystery packages. Some were gag gifts–scraps, pennies, selvages. Some were great–brand new good scissors, best press spray, a gift certificate to a local shop. Fun was had by all, I would say. I successfully sat on my hands and did not come home with any new fabric to add to my stash!! I did bid on one lot of purse supplies-handles, stabilizer, magnetic clasp, and a few good patterns. Paid $100 for it (again–monopoly money!). I also was given a treasure by a fellow member. She found a bag of selvages in the lot she won. To her they’re trash, to me it’s a treasure!! If you are not a member of our guild but think this would be a fun idea for your quilty group, I’d be glad to give you more details. We found out about this concept at a meeting of the NYS Quilters’ Consortium and have adapted it to suit our guild. Always glad to share good ideas! Just reply in the comment section and I’ll get back to you. How is your gifting challenge coming along? (described a few blog entries back). I’ll admit I’ve not made much progress on my original idea for January (to make a Christmas quilt from a Jenny Doan tutorial). I have chosen the fabrics from my stash and have begun to cut them up. I think this is going to be my next leaders and enders project (Bonnie Hunter gets credit for that great concept). I have completed 2 runners though, that will be Christmas gifts. I needed samples for a class I will be teaching so chose the fabrics with gifting in mind. I think I’ll call that a success for this month’s challenge. I’m hoping to get all the fabric cutting for my original idea done this weekend, and to organize it for sewing. Next I’ll be choosing the February gift project for myself. Does any one of you have a report for us on your progress on this challenge? Who is playing along with us? Title is self-explanatory so I won’t say anymore. I think this idea from Jenny Doan is super. You may remember that last summer we came up with a few ideas for these Jelly Roll 1600 quilts. They are archived in the side bar of the blog or you can just search for jelly roll 1600. Many quilters love these because they are so fast, and just as many dislike them because of the “boring” appearance. I don’t know which camp you’re in- I’m in the camp that thinks this idea is great. Click here to see Jenny’s video with an idea for changing up the appearance a bit. Watch to the end. If you went to summer camp, I think you will remember enjoying the same sort of silliness that Jenny and her assistant get into! I will tell you that when you make them with a jelly roll of batiks, they are gorgeous! Click the like button below if you are a fan of jelly roll 1600 quilts! Now for a true confession. A few posts back I put out a challenge to join in Bonnie’s challenge quilt for this year, called Lozenges. I had said I had a plan to use up my stash of 2 1/2″ strips. Well that was before I thought it all the way through to needing to cut a whole bunch of 1 1/2″ squares to use as the flippy corners. I fess up that the cutting of all those triangles is not a task I want to take on right now. So…I’m going to use a different one of Bonnie’s patterns for my scrap quilt. I have made her Scrappy Bargello before (that’s the one my pup is sleeping on in the photo), but I’m going to see about a “string” quilt to dig into my stash of novelty scraps from my days of making kids’ Eye Spy quilts. I’ll report back soon on the pattern I settle on. Perhaps you would want to join me on this side trip from Lozenges. We’d still have quilts to share with Bonnie in the fall. Not all quilters enjoy scrap quilting. There is something way too random for the taste of many quilters when you start making a tossed salad of all sorts of fabrics. I’ve made a few scrappy quilts that push the envelope a bit too much even for me. (The dog loves them though; he’s lying on one of them in that photo.) Thus comes the concept of “planned scrappy”. By adding just a bit of structure to the scrappy theme, more quilters can become comfortable with some scrappiness in their quilts. After all, if you are a lover of Kim Diehl fabrics, for example, you probably have quite a few scraps from her lines. They all go together, don’t they? Or perhaps you have blue in every quilt you make. A 2 color quilt with a variety of blue scraps paired with a variety of creams could be lovely. Our national teacher for seminar this fall, Bonnie Hunter, is a self-described scrapaholic. This morning while checking out the Quiltmaker magazine blog (Bonnie writes a column for each issue called “Addicted to Scraps”.) I ran across this video (here it is). Although Bonnie isn’t the narrator, it is based on a block Bonnie designed for a special issue of blocks which Quiltmaker publishes each year. In the video some good hints for choosing scraps for a block or quilt are given. See what you think. I’m again throwing out a challenge that we make lots of scrappy quilts to share with Bonnie this fall, even if they’re not from her patterns. How about it? Bonnie Hunter, our upcoming fall seminar national teacher, has just begun a quilt challenge at her blog. 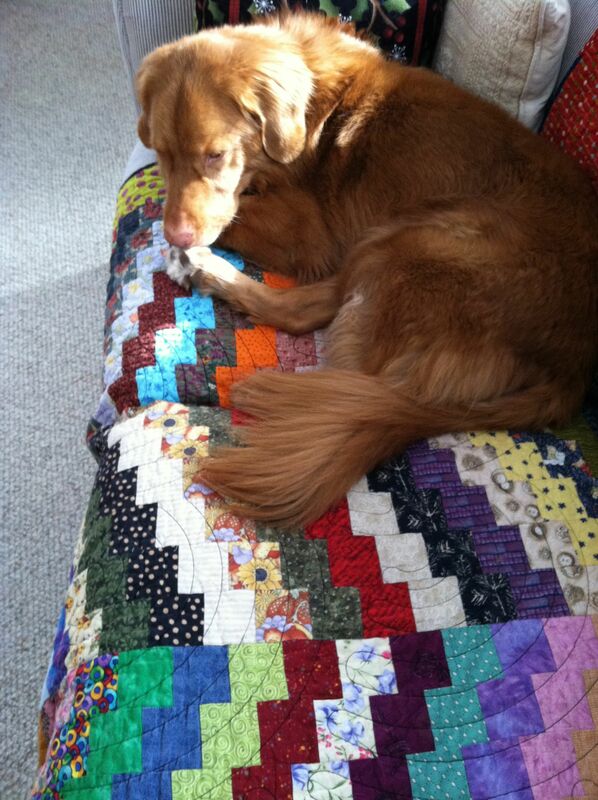 Bonnie is a scrap quilter. She doesn’t just collect scraps; she actually makes things with them. (a novel concept to me!). I’m going to try joining in this challenge so I’ll use up some of my scraps too. I might have to tweak the math a bit because I have so many 2.5″ strips that I’d like to use up–hers is going to use 3.5″ strips. Wouldn’t it be great (hint, hint, hint!) if a few of us joined in so we could show her our progress when she comes to seminar in September? I’m going to set aside a sewing day soon to get a bunch of pieces ready so I can use them as “leaders and enders” while working on projects for my classes. Here’s a link to the challenge: click here. And here’s a link to an explanation of the whys and hows of Leaders and Enders: click here. Are you in?!! If we admit to joining the challenge, it might help keep us on track, knowing others will be asking us about it. I’ll post my progress periodically. Now that I’ve put it in writing, on-line, I have to follow through…right?